I have been wanting to be featured on Rock My Wedding for some time. 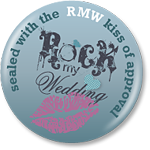 They were recently voted by Elle Weddings as the #1 UK Wedding blog. I love the clean, simple, elegant feel of their blog. The pictures are always beautiful and you can tell Rebecca and Charlotte put a lot of love into the blog (you guys do such a great job!). information. I’m glad that you shared this helpful info with us. topic of this piece of writing, in my view its actually amazing in favor of me.